Hyundai is currently celebrating the 30th anniversary for the iconic Sonata mid-size sedan. The Sonata made its debut in 1985 in Korea, playing a pivotal role in Hyundai's growth and reputation. More than 7.3 million Sonata models have been sold worldwide since its introduction. 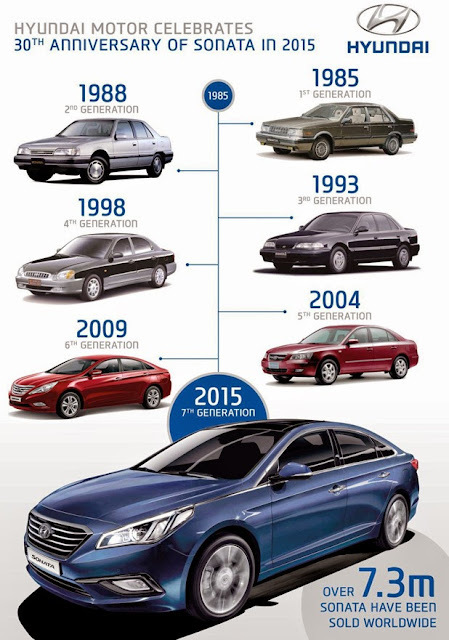 A look back over the past 30 years at the various generations of the Hyundai Sonata. The 1st Generation was one of Hyundai's first models designed exclusively by the carmaker's in-house design teams. The 1st Generation started the Sonata legacy by exceeding one million unit sales in Korea for a single model line for the first time. Unlike the 1st Generation model, which was rear-drive, the 2nd Generation employed a front-wheel drive system for enhanced interior packaging efficiency. As Korea's first independently-designed model, it departed from angular design language and adopted a more organic, aerodynamic design. The facelift of this generation, launched in 1991, was the first model to be badged with the newly revised Hyundai logo. The 1990s marked the acceleration of digital technologies replacing traditional analog technologies. The 3rd Generation leveraged this consumer trend, enjoying robust sales due to many advanced features, including automatic side mirrors and anti-lock braking system (ABS) technologies. The 4th Generation, launched in 1998, was the best-selling model in Korea from February 1999 to August 2000. This generation was sold in Europe and was equipped with an in-house developed engine and a Hyundai Intelligent Vehicle Electronic Control (HIVEC) transmission. It was also the highest scoring mid-size sedan in the 2004 JD Power Initial Quality Survey in the US. The 5th Generation was designed to be a world-class mid-size sedan as a fundamental development target. This generation of Sonata adopted a European design theme, offering premium character and road presence. Equipped with significantly advanced features and a top-ranked safety rating, the 5th Generation Sonata received near universal praise from automotive media and customers alike. The 6th Generation was one of the first Hyundai models to employ the industry-leading Fluidic Sculpture design philosophy. The company claims its bold and compelling design, powerful, efficient engine and solid performance created a new sensation in mid-size sedan markets throughout the world with record sales, solidifying Sonata in the minds of consumers as one of the Hyundai's most recognizable models. In addition, the Sonata Hybrid model was introduced globally in 2010. The latest 7th Generation has further refined and balanced the convention-shattering version of Hyundai's Fluidic Sculpture design philosophy, raising the bar for the mid-size sedan segment in both design and performance. Further, the all-new Sonata expanded its powertrain offerings with two additional eco-friendly models, including the Hybrid unveiled in 2014, and the first Plug-In Hybrid model, introduced at the North American International Auto Show in Detroit in 2015.